We all get so excited to see what products are in all these boxes, but once they arrive there is not a lot of talk about how the products faired. I would really like to get more information about the products that were hits and misses for you all and why. This way we can better order boxes and if there was an amazing product, maybe we can hunt it down ourselves on eBay. The only product I have really heard any reviews on is the Bounce Cheese cream. Once I get my boxes (should be some waiting for me in my post office when I get back from vacation) I will post some reviews of the products. CNP Laboratory Cleansing Perfecta: plain old cleanser, not great for my eye makeup -- eh. 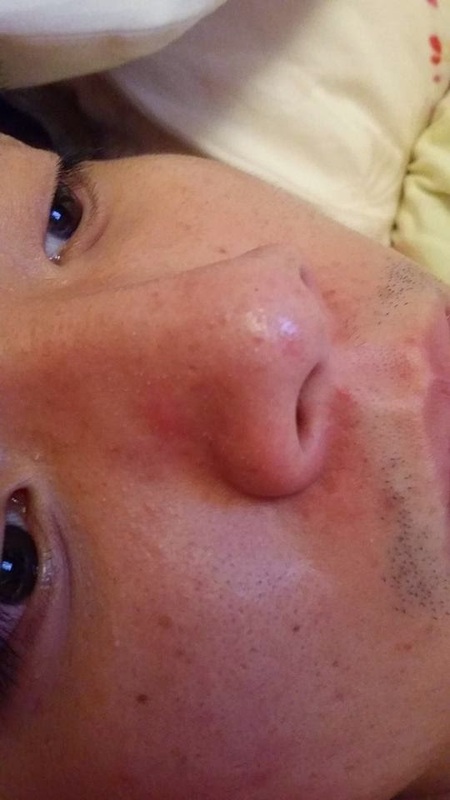 Nuganic Customize Pore Control Essence: too much alcohol, too drying, did not work on cystic acne -- no thanks. Danahan Bon Yeon Jin Essence: I've only got two under eye wrinkles, and I can't tell if this did anything at all -- not sure? Mamonde First Energy Serum: nice pseudo-toner, no real difference in skin though -- do enjoy, not crazy over it. SEP Face Lifting Mask: super pretty, quite comfortable, nicely hydrating, but don't need lifting effects -- still nice! Tonymoly Delight Tony Tint Red: super cute heart packaging, tiny sample but lasts well, cute colour, quite drying -- still love it. Dear by Enprani Bounce Cheese Cream: intriguing texture, very smooth, super hydrating, leaves skin very soft, but VERY sticky and never soaks in all the way -- still a favourite, though. DKDN Real Lucent Super Aquasis Moisture Cream: very liquidy, soaks in quick but leaves dewiness/a bit sticky, less moisturizing than cheese cream, clumps up if you use too much and rub your face -- still quite nice. LJH Dr.'s Care Vita Propolis Ampoule: great ingredients, nothing toxic, propolis hasn't been scientifically proven to help skin yet but can't hurt, included vitamin extracts will help nonetheless -- no effect on my skin but maybe on others? PUREPLUS Hand Cream - Rose: comes out thick, spreads nicely, strong rose scent, nicely hydrating, soaks in quick -- leaves skin not slippery, but still oily so beware when touching phones afterward! JN Neoteric Mandarine Energy Facial Oil: watch out for sun exposure (citrus oil, after all), WONDERFULLY hydrating, soaks in pretty quick -- I love this. MAGITREE The Mist: mostly grapefruit extract so watch for sun exposure, I hate the smell of this so much (I don't like grapefruit) so I've got it up for swaps. Lovely ME:EX Lip Tint Stick SPF 13 - Sweet Cherry: OK moisturizer, subtle pigment that needs to be built up but then leaves lips buried under product -- best used over a lip stain throughout the day to stay vibrant. Cherry-Cherry Lips Modelling Gel Patch: ehhhhhhhhhhhhhhhhhhhhhhhhhhhhhhhhhhhhh, it was OK but nothing special. Clean Face oil-Free BB Cream: grapefruit extract, seems to be almost grey?, for some reason hard to spread on my face, got to try again using different moisturizers underneath -- initial opinion negative. Hyaluronic Acid Essential Mask Sheet: lots of alcohol in this -- so quite drying; obviously was effective in reducing oil and blemishes but at what cost to my skin? Lovely ME:EX Pastel Cushion Blusher - Peach Cushion: cute packaging, subtle colour, good for my skin colour. Rice Ceramide Moisture Cream: super fragrant, average moisturizer -- nothing special. Lovely ME:EX You & Eyes - Sand Brown: very sparkly, only used once but it was cute? Cons - The packaging can be prettier? Pros: Very nice neutral colors, my fav is the charcoal liner, its not to dark and not too light. Cons: The other two pencils don't glide on as nice, they actually leave behind bits and pieces, not great quality. The lip pencil is very subtle, not much pigmentation. Pros: Very Nice moisturizer and it does minimize pores, I've seen a huge difference in just 3 nights/ smoother complexion. Cons: It feels like someone put glue on you're face when you first wake up. Pros - It leaves my skin nice and soft, and it works like a charm, huge difference in my skin, more glowing. Cons - Packaging can be prettier as well? Pros: The packing and the mask is sooo nice!! The lace effect is so cute! It hydrates very well when on. Cons: It was very sticky for a few hours after I took off the mask. The mask actually ripped when I tried to put it on. Pros: One of the best moisturizer creams, it really makes my skin look better, and it feels good when on. I've only received LB#3, and have tried just one product so far I've mentioned it elsewhere, but I'll say it again. I don't think too many people like using bar soap (is it passe? lol). But if you have oily acne-prone skin I would highly recommend giving this a try. It contains sulfur, so be prepared for the smell--it lasts for a bit on the skin after rinsing. The bar is slightly soft and moist when you take it out of the box and stays that way. Don't run it directly under water because it will become soggy mush that never dries. I recommend slightly wetting hands and rubbing the soap to lather up. I leave it on my face for about a minute, then wash. It provides a nice lather and rinses cleanly. Sulfur can be drying, but my skin doesn't feel uncomfortable even though I use this 2x a day. Yay i love the idea of this topic! 1. Banila Co. Friday Night 3D Highlighter - A very silvery highlight, almost white. I don't think i'll ever use this as a highlighter, maybe as an eyeshadow. 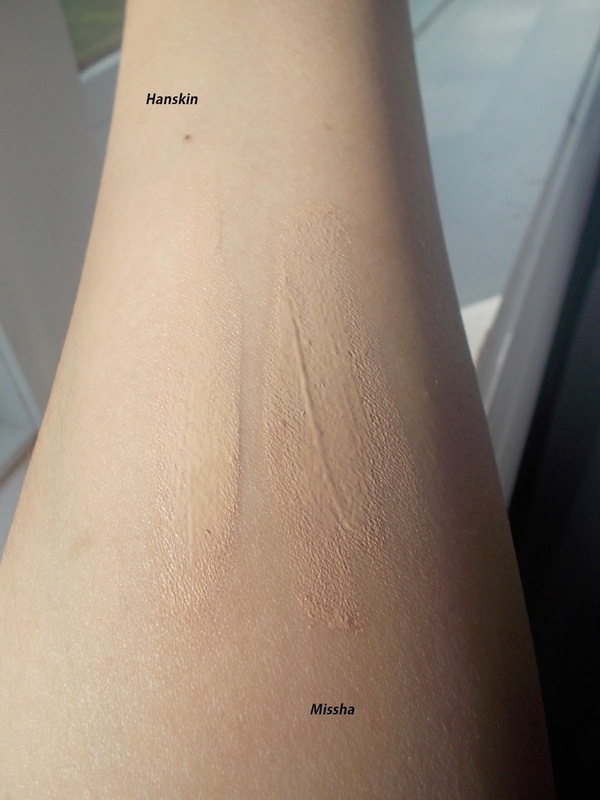 Powder itself is smooth and soft, pigment is alright, definitely buildable. 2. Banila Co. Marbling Shadow in Gold Brown - Packaging reminds me of mac, but it's significantly bigger! The product itself is an okay product. Color wise it's a pretty metallic gold/bronze shadow with shimmer. Formula wise, kinda dry, not super pigmented. 3. Banila Co. The Great Love Extra Bold Eyeliner in Brown - I love this product a lot! Been using this, on days where i feel like doing a little more on my eyes, ever since i got it. It glides on really smoothly, pigmented, creamy. The smudger makes it really easy to create a really soft smokey eye as well. It smudges the shadow kind of unevenly but just keep blending it out and building the color for the perfect day time smokey eye. 4. Banila Co. Intense Care Moisture Balm SPF 13 in Soft Peach - No surprise here, it's just one of those lightly tinted lip balms. Doesn't last very long, the color is very faint and doesn't show up that much on my pigmented lips. I like that it has SPF 13 though, just a little extra something. 5. Banila Co. CC Set - Haven't got to play around with it yet. They actually have the great love liner in the box??!! Omy I've been looking everywhere for that liner! Thank you for starting this topic! I was just thinking the same thing - there are a million blogs that do memebox unboxings and/or first impressions, but few that do real reviews. I'll talk about a few of my favs. I don't really have dry or oily skin. But, if I use too many products for oily skin, I tend to break out with those really painful under the skin blemishes. If I use too many moisturizing products, I get whiteheads. I love this product because it's a great balancing treatment. I tend to use it first, and then top it with more moisturizing products. I haven't had a single blemish since I started using the full Korean skincare regime. Of course, I can't attribute that entire to this product, since I am using lots of others. A big plus is that I only need 2.5 drops to cover my entire face and under the chin area, so this generous sample size will last me forever. I've read a lot of first impressions of this product, and I have to say, I've had a very different experience than most. I saw some say it was super drying and others say that it stayed tacky all night. Maybe I use it differently - I use this as my last step so I find it does a great job of helping all my products sink in and retain moisture. I also don't use a ton of the product - I imagine the sample size will last me about 5-6 months. Perhaps this is why I don't find it sticky. I wake up with wonderfully soft skin when I use it. Eye creams are tough because I really want instant results. However, after using this product for about a month, morning and night, I have seen a reduction in darkness under my eyes. I would also say that my fine lines are slightly less noticeable. I'd say that's a win considering most eye creams do nothing. Oh man, I love this BB cream. 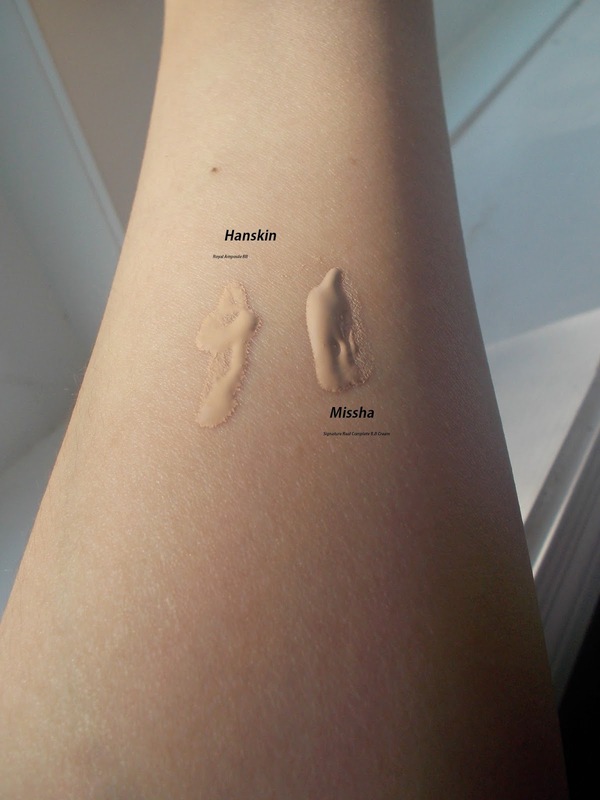 It's a perfect match for my skin, great medium buildable coverage and blends easily. Plus, SPF! I wish it were easier to find online to buy. If anyone has this and it's not a match, please let me know - I want it! I use this cream as my night cream and I love how soft it makes my face feel. I would wake up in the morning, and my face is so soft and smooth. I can see why so many people love this. It has a slight pleasant smell. 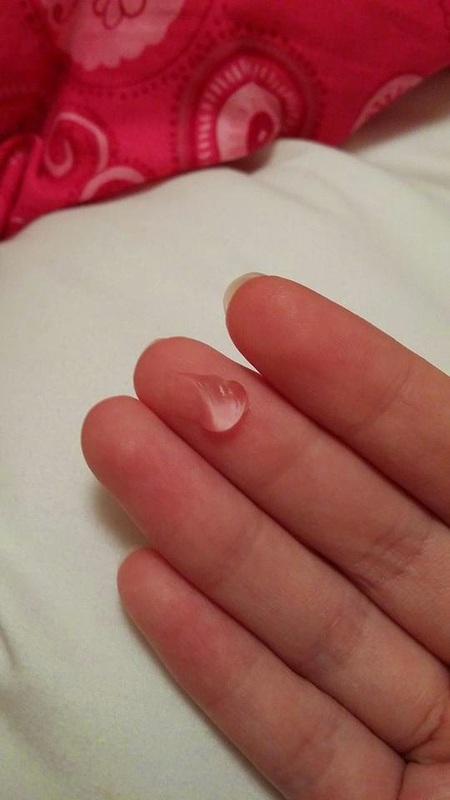 For someone with sensitive skin, it hasn't made my skin break out or anything. This is my HG for oil cleaning. A little goes a long~~~~ way. I only use about 1.5 - 2 pumps and this thing expands(?) once in contact with water. It makes my skin feel so soft and smooth and CLEAN after using it. I use it 2 times a day, once morning and once night time because I have oily, sensitive skin so skin gotta be clean before and after bed. I think this is one of the best full size cleanser Memebox has ever given out and considering it's about $73 for a full size, it's a steal. This is okay. I didn't notice any pore reducers or anything. I feel like it's just another one of those so-called pore controler. It's a pretty decent size. Probably only take like a year to use it up as I only need about 2 pumps and since I got 2 of them..yeah. Love this! I use it right after my toner and it has yet to break me out or anything. It's actually make my skin softer. use this twice a day. I like how it has an SPF 50. It's pretty easy to blend into your skin and doesn't leave like the white/gray cast as other sunscreen does. Only down size is that my tube, at least, didn't have much product inside. I felt like it was only half, maybe less, full. Probably got a bad one of something, IDK. Another one of that I love. I'm not the type that use bar as my method of cleansing as it can dry your skin out horribly. But this one my friend, does the opposite. My skin does not feel dry or flaky or anything, My skin felt smooth and clean. And I notice that it made a few of my soon to be pimple disappear. It lathers really good once in contact with water. been using it about 5 times now, and it's still in good shape. It has a weird smell. Nothing too over the top, but it's weird. Not sure how to describe it. Only used this cream about 3 times and can't really tell much yet. But from what I've experience, it's not bad. It definitely control my oil (not much but pretty decent) and is moisturizing enough. It's in a small jar but a little goes a long way. Well, first off, I don't have any wrinkle or fine lines or anything at/near my eye, but it doesn't mean I can't start prevention early right? So far, I don't notice any difference or anything, but it is pretty moisturizing when using. Maybe I should give it to my mom and have her be my tester. This has got to be my favorite cleanser beside the Caviar Cleanser. A little goes a long way. Since using, I notice I don't break out as much A good sign right? It also makes my skin feel so clean and soft. I tend to use this with the Caviar Cleanser alot, and the duo makes me feel like I'm in heaven..or rather my skin in heaven! I need more of this. Where can I get it? Uh...I don't hate this, but I don't like it either. It has an incense kind of smell. Not sure what else to say. It's a nice whitening cream. My face does look brighter when I wake up after using it at night. I use this under a night cream. Again, a little goes a long way for this. Don't make a mistake of using too much on the face because then you gotta spread it down to your neck and chest. I only used this once and let me tell you, a part of my face felt hot almost like burning like feel. I had to wash it off immediately as it was starting to itch also. I'm not sure if I'm allergic to an ingredient in it or my face wasn't liking it much, but I haven't use it since then. I'll try again, but lets hope my face doesn't react to it. This nail polish has a shimmery effect to it. Nothing over the top and it's pretty nice. I got a darkish burgundy-ish color..almost like brown, but not quite. It's doesn't look good on my skin tone though. I love this palette! The colors are so cute, pretty and fresh! They work well for both lips and cheeks. When I used it on my cheeks, in blended super easily and they were all perfect colors. They are kind of staining, so I'd imagine they'd last quite a while. On my lips, they are just as cute! But, they are super drying on the lips. I noticed that it really made dry areas and flakes show up, so I'm going to need to try to heal my lips up (so hard, my lips are in horrible shape...) They stain the lips. I had to rub it off for awhile, but it didn't take off all the color, which is a good thing! It means I won't have to re-apply lip products, aside from lip balm. I do recommend using lip balm with it on your lips because of it bring really drying. Think of it being similar to the Benefit tints for drying lips out. Macqueen "Loving you Glow Tint"
This is pretty much just a dupe for Dior Glow balm. I already have the Dior version, but was looking forward to getting something similar. I actually like the Macqueen version more because it is more moisturizing. I'm not sure the color is quite as good, but it is still nice. I need all the moisture I can get, so the Macqueen version wins for me! Thank you! I was hoping they include more BB/CC creams/ cushions since Koreans are huge on that. Even if the color doesn't match, we can still mix it to our foundations etc. Also curious about multi creams. In fact, I've only gotten a few repeats and they were products I was thrilled to have a backup of (Dr Jart eye cream, tea tree essence and the Heart face pore sleep pack). Maybe I've just been really lucky. And knock on wood - they haven't put that awful foam "dry" shampoo I read so many reviews about in any of my boxes. At least they aren't trying to pass off the products that everyone seems to have hated as luckybox 'favorites'. Well I tried using the Heart Face Sleeping Pack again last night.. and my face does not like it. I actually broke out from it. I gave one to my sister to use. Now I have 2... probably gonna give it to someone or so. The Missha Box - Signature BB cream is to beige for me as well as the Hanskin Ampoule bb cream from Memebox Global #10:( all of the bb creams in every box Ive received are all beige, a very pink undertone, I have a yellow undertone... so it makes my face look red when I wear it, very unfortunate... Its very hard for me to find bb creams and foundation to match my skin tone..
thanks for the reviews. Sorry to hear that none of the BB cream matches ur tone. One day you'll find ur HG. Have you tried the Dr. G. Bing Bling cream??? It has Avery light colouring and I am in love. Thinking about buying the new naked box just so I can get a backup. So I've been using the Recipe cleaners from the sampler pack, and I can't say that I like them. Once I get past how insanely cute they are, the products themselves are just meh. The Green Tea one dried out my face so much that I felt like I needed to slap on a moisturizer immediately after using it. The Adley one was ok, though still a bit drying. The Lemon smells like I am rubbing PineSol all over my face, ha! The lemon smell is super strong, and I'm not a big lemon fan in the first place. So sad that I didn't like them more. On the other hand, I LOVE the Zivon Plu body scrub from the Hair & Body box! LOOOOOOOVE! It's the perfect amount of grit for me, and the smell is wonderful! Too bad I can't find it online anywhere except for buying a lot of 6 of them for $70. I know what you mean *sighs* I love the Psy masks we received in box 8 and would love to purchase it in bulk, but I could only find it for sale in singles. Have you tried looking on Ebay? I just did a quick search for the two products you're interested in and found them. Both are from sellers located in South Korea that offer free shipping & samples. The SEP mask was 16.99 for 4 & the Zivon Plu body scrub (purple version) was $12.98 for 200g. I would post the links, but I think it might be against the rules. So if you can't find them then I could always PM you the links. I had looked on ebay for the scrub, but I can't help but wonder if the purple one has the same smell? I might just get it anyway and check it out. And I hadn't looked for the masks, but thanks for the heads up! Doesn't look like they have any other kinds of masks except for that "lifting" one which is what I was hoping for. I'll have to remember to check ebay out first when I'm looking to re-buy meme items! 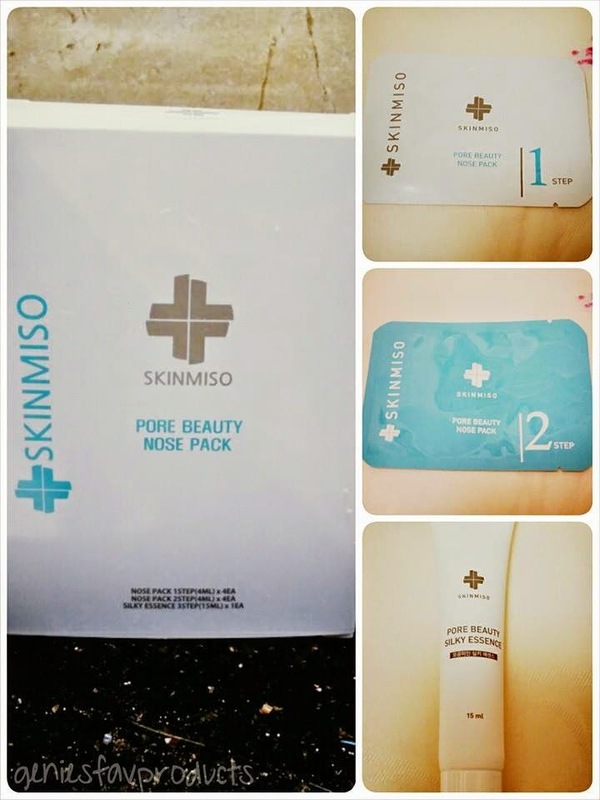 I recently came across this Pore Beauty Nose Pack by Skinmiso (it was inside my Memebox Superbox #11: Before Special Day), and it really is OUR HOLY GRAIL PRODUCT!!! 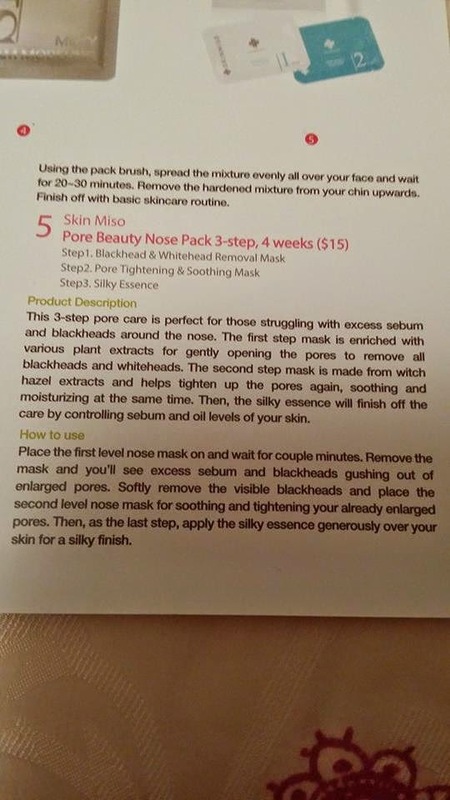 It is a 3-step pore care for those who are struggling with excess sebum and blackheads around the nose. Unlike other nose packs, this is not the type that sticks onto your nose and you have to painfully peel off afterwards! Place the Step 1 Mask onto your nose and wait for 10-15 minutes. The mask will give you a cool and refreshing sensation, and it will open up your pores to make the impurities come out easier. Can you see how it is big enough to even fit on a man's nose?! That's awesome! Remove the Step 1 Mask after 10-15 minutes, and you will see the excess sebum and blackheads gushing out of the enlarged pores! I was really shocked to see how much of the excess sebum/blackheads that had already floated to the surface of the skin!!! Gently remove the visible blackheads, whiteheads, or any other impurities clogging your pores using a blackhead extractor. Do the probing in quick motions and avoid harsh dragging or scraping across the skin. 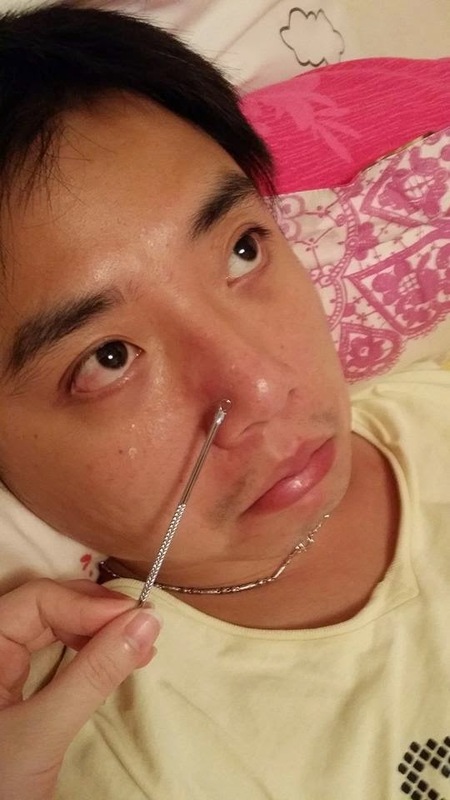 Hubby wasn't very pleased with this step, as it was quite painful, but it wasn't as bad when I changed to use my blackhead extractor instead of his one - the shape matters! The blackheads were also very easy to extract, as they had all floated to the surface of the skin after applying the Step 1 Mask! 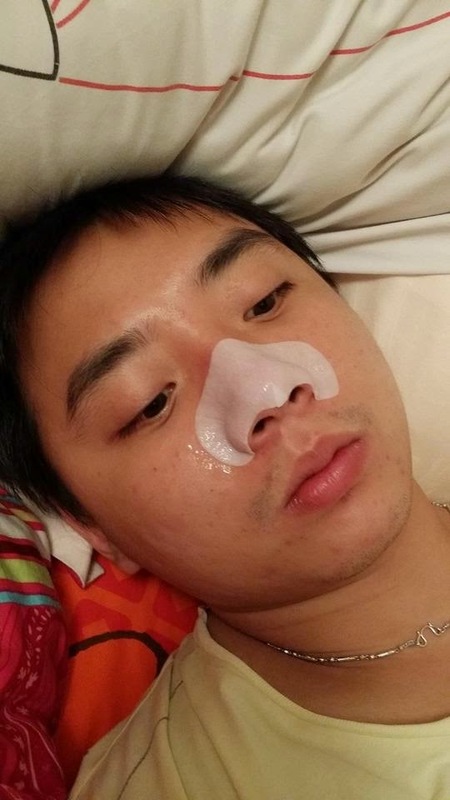 Place the Step 2 Nose Mask onto your nose area as you did with the first mask. This Mask will help soothe and tighten up your already enlarged pores. Wait for another 10-15 minutes. 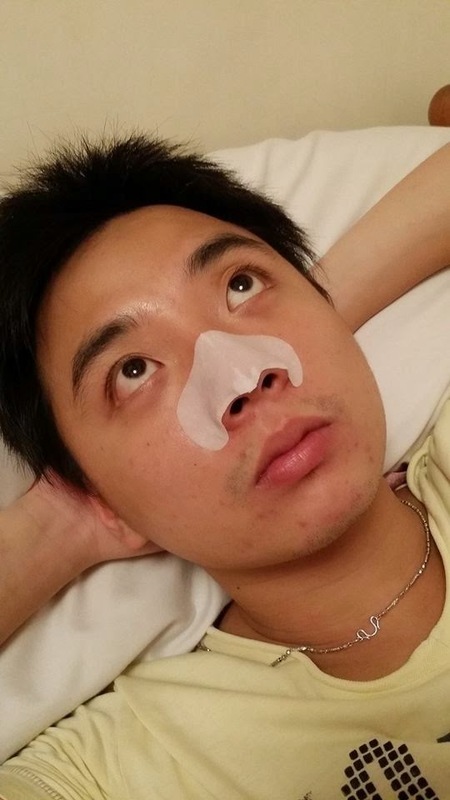 Remove the Mask after 10-15 minutes, and you will see that the pores are tightened already! Massage in the remaining essence into the nose, then rub a tiny bit of the Silky Essence over your nose for a silky-matte finish! The Silky Essence will finish off the process by controlling sebum and oil levels of your skin! Before using the pack, I also made hubby use the Multiberry Yogurt Peeling Gel by Laneige, so that it would "soften" his skin and make the pore extracting process easier. I also applied toner to his face before applying the Silky Essence, then I applied his usual essence, serum, and lotion to his face afterwards. We were very pleased with this product, and we are thinking of repurchasing it already!!! I did a search online, and saw them retailing for approx. US$20.99 for a 10-week pack (I was only give a 4-week pack inside my Memebox). Has anyone else tried this product before?